I think I played too much of that sword fighting game on Saturday - I ached so much on Sunday. So much so that I had to give the swinging of invisible swords a miss! :o I did do some archery & bocce (and fail at table tennis) tho. 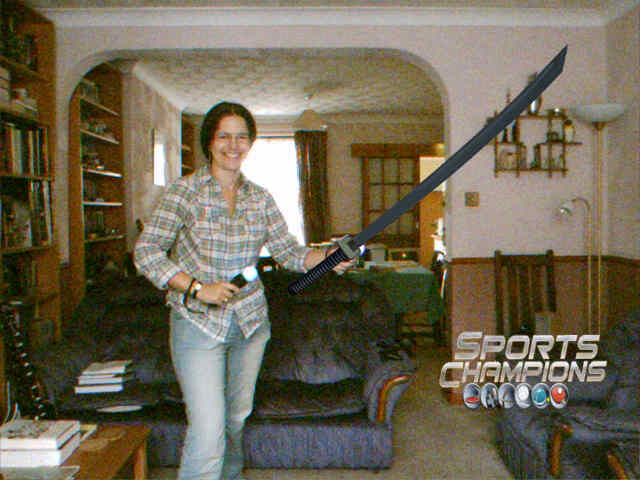 Yesterday I felt up to more & I finished off the bronze cup for Gladiator Duel mode :D It takes a little pic at the end of you posing with your sword (or bow for archery etc) and lets you just keep it, or post it on your facebook wall (the Sports Champions company host the pics tho, not facebook). So I have a very silly pic of me & a fake sword here. I sat & stared at it for a while after I posted it trying to work out what was wrong, coz it just felt subtly not right ... it's mirror-imaged! Looks like I'm holding the sword in my left hand.